On Thursday we attempted a screen free day at our house. To be honest, it was mostly for me. Our kids don't watch that much TV, but I check my phone/internet a bit too much sometimes... so I decided to make it a screen free day! Having a little 3-year-old on my case all day reminding me that we were taking a break from TV, computers, iPads, and phones definitely made me more accountable. 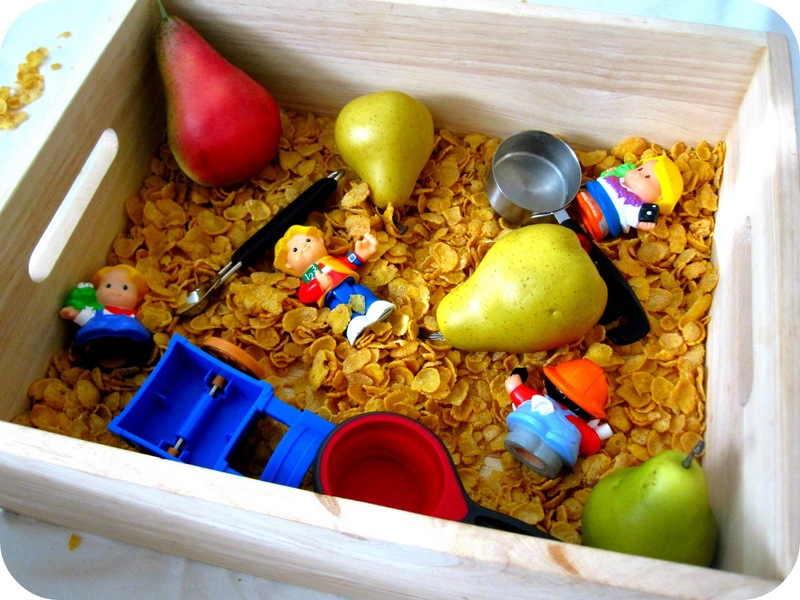 The kids spent a lot of time playing with their cornflake "fall" crunchy sensory tub (Thank you Play Challenge Day 9) while I organized pretty much every disaster cupboard in our kitchen. I'm not posting the before pictures here... but they were pretty terrible. 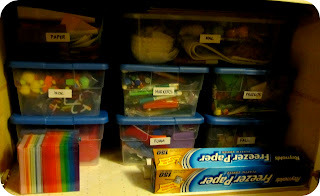 I labeled all the bins, organized projects, and got rid of a lot of junk. The cupboards still aren't perfect, but they feel so much better than what they looked like before. I also put together this little bin full of stuff that we seem to use the most... so that it is easy to grab when we are working on projects. I need to put together another one with a few things that are good exploratory crafty materials - googly eyes, pipe cleaners, craft sticks, etc. 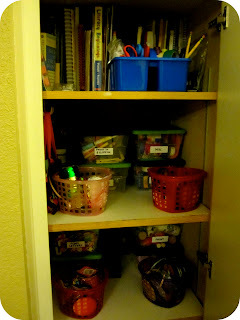 What would you include in a little bin like this? 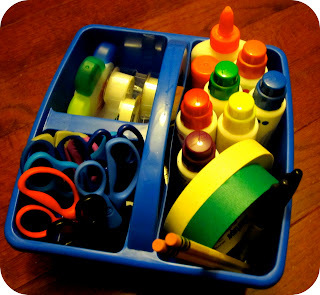 What are your child's favorite crafty supplies during independent exploring time? Have a fabulous Saturday!! Next week we'll be hosting our Best of November Link Up, so start deciding which post you want to share. I can't wait to see all of your ideas! I will join you in a screen free day. I always find myself checking my email a little bit too often. Love your tidy cupboards, mine could do with sorting. I love the crunchy sensory bin - what a great idea. Great idea... with the screen free day!!! I think I'll give that a try. Thanks for sharing your art cabinet. I'm going to try to work on mine today. YIPPEE!! !